A food critic can dish it out, but can he take it? Revenge is on the menu for notorious blogger J. T. Franks (Joshua Leonard, Humpday, The Blair Witch Project) when he publishes a rumor which leads to the demise of TV chef Peter Grey's culinary empire. Grey (James Le Gros, Zodiac, TV's Mercy) kidnaps the writer, confines him in a remote cabin and presents him with a series of deceptively simple food challenges - from preparing a perfect egg over-easy, to grilling a steak precisely medium-rare - punishing him for anything less than total perfection. Bitter Feast is an exploration of the creative impulse gone tragically and ferociously awry. 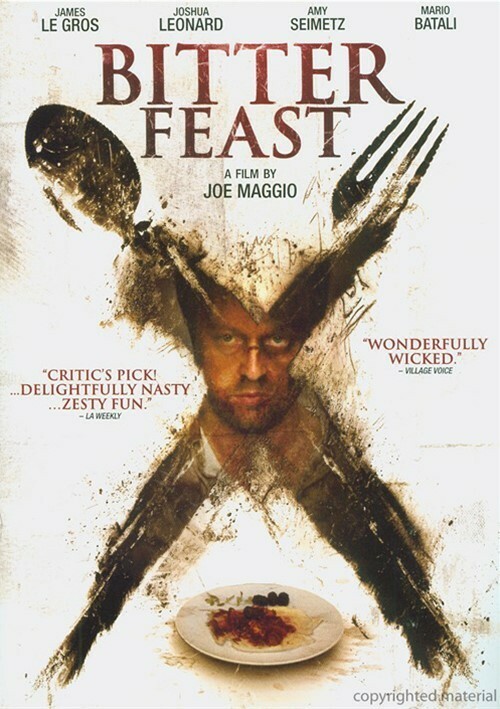 Indie horror icon Larry Fessenden and renowned chef Mario Batali co-star in this tense shocker, which is served up with wicked wit and savory flair.